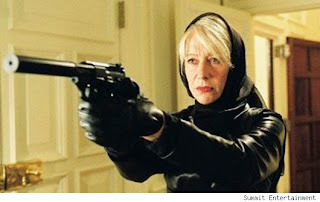 Helen Mirren attempts to warn me of the vast conspiracy. This is my attempt to take a 'light hearted' look at the scariest fact of diabetes - hypoglycemia - a.k.a. low blood sugar or the lows. It's not really a funny topic, and it certainly doesn't feel funny to you or your friends and family when it's happening but it does sometime result in some funny stories. Before I had my pancreas surgery I had diabetes education classes and meetings with my endocrinologist where we discussed low blood sugar. I learned to logically recognize the symptoms so I would be aware when it happened but I was in no way prepared for the reality. While I recovered in the hospital the nursing staff and the endocrinology team kept a close watch on my blood glucose so I didn't experience a low for my first week as a diabetic. It wasn't until I started recovering away from this hospital in a near by hotel that I experienced my first real low. I woke up in the early morning hours and felt 'prickly' all over. I was soaked in sweat which was a foreign feeling for me since I am not much of a sweater. I struggled mentally to understand what was going on and couldn't grasp it. I couldn't focus and felt an overwhelming sense of panic - could I be dying? It only took about about 30 seconds or so for me to understand that I was experiencing my first low as a diabetic but 30 seconds is a long time to feel that kind of mind searing panic. Over the past several years I've learned to deal with lows. Having good control on your blood sugar is often a fine line between a good number and a low. Luckily I am not susceptible to seizures and have never ended up in the ER for a low. I'm also not likely to get angry - you sometimes hear about diabetics who get really upset and unreasonable when their blood sugar is low. I am more likely to get things mixed up in my mind and use words incorrectly or forget the word I'm trying to say. I think my friends and family now know if I start acting spacey that it's likely my blood sugar going low. What truly can worry me though are the lowest lows - likely when my blood sugar drops into the 30s or lower. This is a scary place where coherent thought and reason leave and any stimulus gets folded into my reality. A couple of years ago, while cleaning around the house and watching the US Open, I found myself truly distraught over the fact that Serena Williams was sent out to the court to play when her blood sugar was so low. How dare the officials allow her to do that? How could she play so well when I knew how lethargic her limbs must feel. Fortunately I realized soon after starting to cry in frustration for her that it was me that had the low blood sugar. Funniest though was sitting on the couch several months ago and watching the movie Reds. The movie is about several CIA agents who have retired (selectively or otherwise) who band back together to avenge a friend's death who had uncovered a conspiracy plot. Actually, it's quite possible that I don't properly remember the plot - don't take my word for it. Anyway, I became convinced during the move that the characters were trying to warn me that MY LIFE WAS IN DANGER and that I was to be a victim of this conspiracy. I became so convinced that I became determined that I couldn't let Ellen, who was sitting on the other couch 10 feet away from me, know that I was now aware of this conspiracy as she might possibly be involved. For several minutes I was wrapped up in this hypoglycemia delusion and did my best to hide it from Ellen by sitting still and quite as possible. Like I said - I've never been angry or violent when low but if Ellen had questioned me at this point I might have reacted badly - so I can see how it happens. Time to start shoving in the candy! Susan - thanks so much!!!! I have been seeing some of this with my older daughter and been wondering about blood sugar. Our appt was scheduled for next week and reading this with her has heloed us put some framing around her symptoms.